The MQM chief Altaf Hussain‘s conditional call for separating Karachi city from Pakistan comes closer to the independence of Singapore from Malaysia in 1965. The Singapore separation from Malaysia that it willingly joined in 1963, was the result of extreme strife, unbridgeable disagreements and ethnic bitterness between the Chinese origin population and the native Malayans mostly Muslims. Is it also the blue print of Jinnahpur that was later swept under the carpet? Altaf Hussain the fiery and unbridled chief of MQM has enslaved or indoctrinated his Muhajir community, mostly settled in Karachi city after their migration from India in 1947. By his rigid and merciless authoritarianism, instead of integrating, he has isolated his community from the mainstream populace of Pakistan. MQM is basically a movement for the sake of Muhajirs as an ethnic entity and not for the Pakistani nation. Since its formation in 1984 as Muhajir Qaumi Movement and later renamed as Muttahida Qaumi Movement in 1997, the imprint of MQM in the minds of the people is that of a kind of mafia or an entity of roughnecks or extortionists. It is believed that the special death and terror squads within MQM kill, kidnap and torture their rivals including the critics from within the MQM fold. There has been also a prevailing impression that has gained ground, that the extortions or the obnoxious “parchi system” was first started by MQM to raise funds for the organization to become financially robust for carrying out its political and apolitical activities. Undoubtedly Altaf Hussain has proven to be a great and unassailable master and unbending and strict lord of his party. He can summon the multitudes of Urdu speaking Pakistanis and Muhajirs within a matter of hours and with one call. They all gather at a venue with their heads down and hands motionless unless raised to cheer or clap for the scathing tirade of their great master. They sit rather motionless for hours together listening to his long, dreary and high pitched discourses as if they have been bewitched or mesmerized. There is a gossip that anyone who does not clap or come to the assemblage is dealt with vindictively. Several pioneering cohorts and companions are alleged to have lost their lives in all these years ostensibly due to their opposition of the ruthless leader with symptoms of indiscretion. Their names are in the public knowledge. The MQM captures most seats in Karachi both for the National Assembly and for the Sindh provincial assembly. These seats in the distant past used to be shared by Jamaat-i-Islami and some other political factions. But for many years now these are exclusively bagged by MQM. With a sizable number of seats in the federal and provincial parliaments, the MQM gathers enough bargaining clout and leverage to share the power at the center and in Sindh. The latest show of their bargaining power was brought to bear in case of their coalition with the PPP government in the national assembly for almost five years with some brief walkout periods. The MQM has been playing its bargaining card with great dexterity and with a mix of pressure and fear hanging upon the main coalition partner. Thus it would be in a decisive position always to draw as many perks and concessions that it would place on the table for becoming the coalition partner. The MQM’s political behavior for all these years has been to browbeat and flex its muscles whenever its hegemony was challenged by other groups within the context of Karachi and broadly in Sindh. A shrewd and Machiavellian person like president Zardari has always been going extra mile to accommodate MQM’s demands not matter how unreasonable or excessive those would be. However, the May11, 2013 general elections seemed to have changed the turf, the ground realities, terms of engagement, and environment specifically in Karachi, Hyderabad and generally elsewhere in Sindh province. For the first time there have been aggressive contests with the MQM candidates. The PTI and JI have jointly put up candidates in the constituencies that were out of bound for non-MQM parties. Yet those who lost in various constituencies alleged serious irregularities and indeed rigging in the areas inhabited by the Muhajir communities. The terror and revenge that is associated with the covert and overt activities of MQM, restrain the rival candidates and their supporters to canvass or carry out their electioneering campaigning. Also, for the first time, there has been massive reaction from other political parties contesting the elections. As a result there could be a possibility that reelection or recounting of votes is disputed constituencies is considered by the Election Commission. That possibility has outraged Altaf Hussain so much that he has implicitly demanded separation of Karachi from the rest of the landmass. By broaching the separation of Karachi from the rest of Pakistan, Mr. Hussain seems to be stepping into the shoes of Mujibur Rehman who was the architect, executor and proponent of cessation of East Pakistan. Although in all fairness, the West Pakistani politicians and the army was much to blame for the tragic dismemberment of one united Pakistan. The latest address of Mr. Altaf Hussain is pregnant with serious threats and warnings to those who according to him were trying to push the Muhajirs to the wall. If it happens he thundered, neither Pakistan nor its perpetrators would survive. He also lashed out at the media and those journalists who opposed MQM and dubbed them as barking dogs. Altaf Hussain has the seeds of a great leader and in this role he has converted his thus far meek and marginalized community into a monolithic, united, formidable force that rose to prominence to the extent of becoming a shareholder in political power. But instead that he himself should have looked upon as an apostle of peace and love, he came to be known as a dreaded and pitiless czar and a violent baron. The MQM itself bore the stamp of an ethic entity with a prevalent perception that it was like a mafia that mostly uses terror and intimidation to draw loyalty out of its cadres. 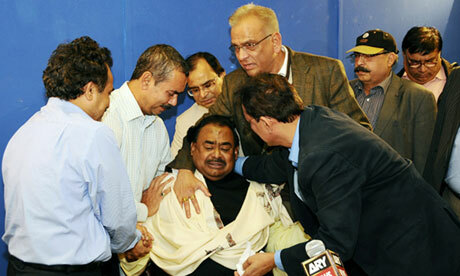 Thus Altaf Hussain unwittingly or inadvertently isolated the MQM from being a party of the national standing. In his latest tirade from London, while mentioning Mujibur Rehman and the break-up of Pakistan in 1971, he threw the idea of separating Karachi an independent unit if MQM”s mandate was not acceptable to the establishment. He warned that by giving one call he could create mayhem in Karachi. Does he want further dismemberment of Pakistan and is prepared to fight back by mobilizing the Muhajir community? Does he know that the conditions behind the separation of East Pakistan in 1971 were drastically different from those related to Karachi? Does he mean India would replay her role of further truncating Pakistan and free Karachi for the migrated population to live independently? Can his statements no matter emotional, be interpreted as seditious and treasonable? It would be absolutely preferable if MQM sheds its image of being a rogue entity and Altaf Hussain elevates his role from an ethnic boss to that of a national leader. Instead of donning an insidious role like Bal Thackeray or eyeing on what Sheikh Mujibur Rehman right or wrong achieved, he should liberate and unleash his own people from his fearsome stranglehold. Regardless of what the press projects about him and the MQM, or what his questionable conduct has remained thus far, he should rise above the ethnic straight jacket and serve the entire Pakistani nations. He should speak and represent the people of Pakistan and not exclusively Muhajirs. That role would endear him to the entire Pakistani nation and he would be venerated not as a clan lord but a lofty leader of national prominence. By way of suggestion, he should rename Muhajir Qaumi Movement ( MQM) as Pakistan Qaumi Movement(PQM). This and other articles can also be read on www.uprightopinion.com. UK High commissioner in Pakistan Adam Thomson called on Chairman PTI Imran Khan to inquire about his health in SKMTH. Mr Khan raised the issue of the inflammatory speeches made by British citizen Altaf Hussain leader of MQM from London to audiences in Karachi. He expressed his concern and asked the British envoy to take note of the violation of British law committed by Mr Hussain through these speeches. Mr Khan called for a warning to be issued to the MQM leader in this regard. Altaf’s threats to the TV anchors & Commentators. Altaf’s threat to the news anchors. Bhai ab nahi chalein gi yeh dramay baziyan. The nation is awake now! They know how to stand against unjust. WE ARE NOT SCARED ANYMORE! This entry was posted on Friday, May 17th, 2013, 10:27 pm and is filed under PORKY ATAF "BHAYON KA QATIL" HUSSAIN. You can follow any responses to this entry through RSS 2.0. Both comments and pings are currently closed.